If you're like many couples, you were the beneficiaries of some cash as gifts at your wedding. And if you happen to be honeymooning (or even got married) in Las Vegas, there are world-class shopping areas where to spend it. From Jimmy Choo to Maserati, Tiffany to Prada, an impressive number of the world's best brands have a home in Las Vegas. Just about every Las Vegas casino hotel has an indoor shopping area, but some are better than others. Below are my recommendations for the top places to go shopping in Las Vegas. The greatest collection of upscale brands under one roof, the expansive Fashion Show Mall is centrally located on the Las Vegas Strip, across from Wynn Las Vegas. It is within walking distance of most Strip hotels, and you can also reach it by catching the bus that runs up and down the Strip, or by taking a short taxi ride. Swellegant anchor stores include Saks Fifth Avenue, Neiman Marcus, Macy's, and Nordstrom. In addition to offering stylish men's and women's clothing, the Fashion Show Mall features more than a dozen jewelry stores. For those with more modest budgets, you can shop at Anthropologie, Ann Taylor, Everything But Water, Forever 21, and Guess. Lost at the tables? Make up for it by saving here. There are currently 155 stores at this upscale outlet mall, and the tally is growing. Retail shops include the usual suspects (Tommy Hilfiger, Liz Claiborne) along with brands one normally doesn't find at outlets (Benetton, Dolce & Gabbana, Tahari, Timberland, L'Occitane). Las Vegas Premium Outlets is located about 15 minutes from the Strip, and couples without a car can catch the Downtown Shoppers Express or the Las Vegas Strip Trolley to get there. If Caesars Forum Shops transports Las Vegas visitors to Rome, the Grand Canal Shoppes at The Venetian Las Vegas surrounds them in a Venetian atmosphere. An extraordinary agora carved out of the desert, the Grande Canal Shoppes features a good selection of trendy and stylish merchants including Agatha fashion jewelry, ​Bebe, BCBG Max Azria, Burberry, Canyon Ranch Living, Davidoff, Kenneth Cole, and Sephora. 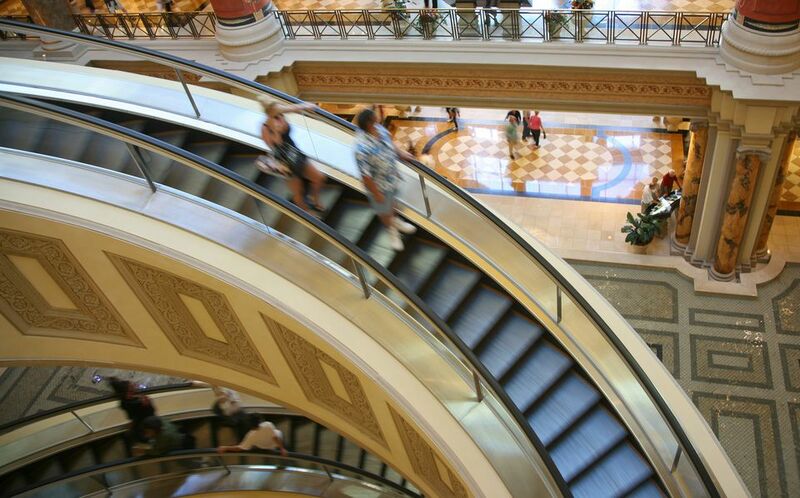 Shoe connoisseurs know this shopping spot as the location of Jimmy Choo's Las Vegas outpost. Inside Planet Hollywood Resort & Casino, the Miracle Mile contains 170 mostly mid-priced shops and restaurants. Miracle Mile Shops, located mid-Strip, are especially heavy in health and beauty goods. Find dedicated shops for Aveda, Bath & Body Works, the Body Shop, Clinique, H2O, L'Occitane, Origins, and Victoria's Secret Beauty here. It's the perfect place to pick up a scented candle or fragrant bubble bath to make a honeymoon suite feel even more special. Home to many of the world's most elegant brands, Via Bellagio hugs the perimeter inside the Bellagio casino hotel. Its boutiques include Giorgio Armani, Bottega Veneta, Chanel, Fred Leighton, Dior Prada, Fendi, Tiffany & Co., Gucci, Hermès, Yves Saint Laurent. As befitting the most expensive casino hotel on the Las Vegas Strip, Esplanade at Wynn Las Vegas is a collection of high-end, brand-name retailers where visitors are more likely to window shop than pull out the plastic. Wynn Las Vegas Esplanade features boutiques for Brioni, Cartier, Chanel, Christian Dior, Graff diamonds, Jo Malone, John Paul Gaultier, Judith Lieber, Louis Vuitton, Manolo Blahnik, and Oscar de la Renta. Those who are uncommonly lucky in the casino can then pick up a Ferrari or Maserati at the Esplanade's exclusive Las Vegas dealership.